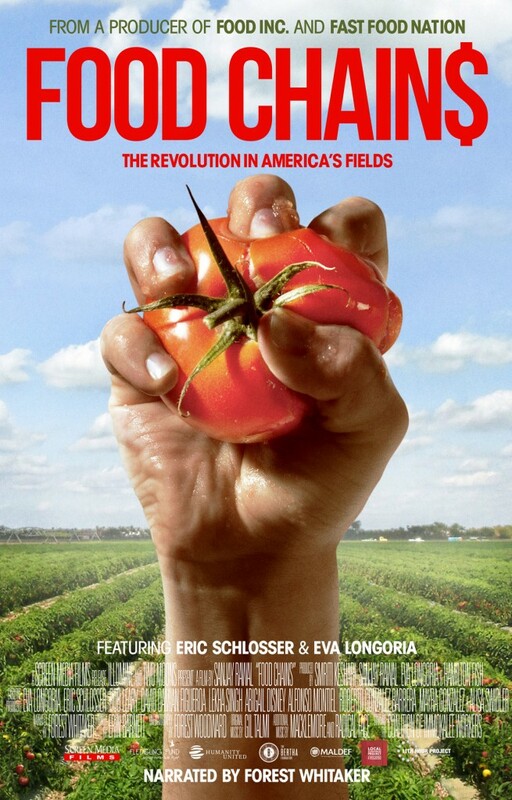 The Eva Longoria-produced doc FOOD CHAINS is about the modern farmworkers movement, full of surprising facts about the supermarket industry (it’s bigger than the tech sector) and its relationship with the the lives and pay of farmworkers today. It follows activists in Florida – the CIW, which was successful in brokering a recent, monumental Fair Food Agreement with Wal-Mart. Featured in the film is Eric Schlosser, Lucas Benitez (activist), and Gerardo Reyes Chavez (activist). There is more interest in food in the United States today than at any time in our history. Yet, there is very little interest in the hands that pick our food – the hundreds of thousands of people to whom we are all connected through our purchases at grocery stores, farmers’ markets and restaurants. Food Chains explores critical human rights issues in American agriculture from wage theft to modern-day slavery and exposes the powers that perpetuate these un-American violations of human dignity. The film stars dozens of farmworkers as well as Eva Longoria (Executive Producer), Dolores Huerta, Eric Schlosser, Robert F. Kennedy Jr., Barry Estabrook, and the Coalition of Immokalee Workers. For more info, visit FoodChainsfilms.com. “Food Chains” hits theaters on November 21, 2014.